Tampa, FL (May 2014)—The entrepreneurial life is rife with potential pitfalls. You can pour your heart and soul (and life savings) into a venture, do all your due diligence, toil 80- and 90-hour weeks, and just when you’re on the verge of a breakthrough, a dark horse competitor sweeps in and decimates your market share. Or a key vendor declares bankruptcy. Or a partner defects with your top client. Or a new law undermines your viability. “There are certain predictable mistakes that will derail a new company,” says Panaggio, author of The Risk Advantage: Embracing the Entrepreneur’s Unexpected Edge. “A lot of them have to do with misguided attempts to minimize risk. Others are based on misconceptions about how the business world works, what motivates customers, and so forth. And here’s the thing—many of them seem perfectly harmless, even smart, on the surface. Along with several partners, Panaggio has built two thriving companies: Direct Mail Express (which now employs over 400 people) and Response Mail Express (which was eventually sold to an equity fund, Huron Capital Partners). He wrote The Risk Advantage to help entrepreneurs face the many situations, predicaments, and crises they’ll encounter during their lives and to help formulate their leadership style and business strategy. Yes, risk is scary. But the truth is, unless you continually embrace risk, your business will never emerge from mediocrity. Panaggio insists that risk is the only thing that can give you the edge you need to distinguish yourself from the competition and reach your full potential…and that’s worth making a few mistakes along the way. Putting it all on the line is a frightening prospect. 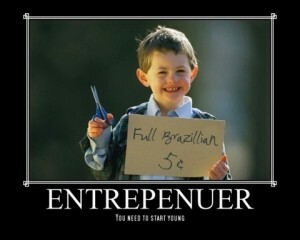 That’s why most entrepreneurs (understandably) want to keep some cash in reserve for a rainy day. And yes, Panaggio acknowledges that giving up your hard-earned money is the ultimate risk. To pour your life savings into an entrepreneurial pursuit is like walking the tightrope without the benefit of a safety net. But even though the commitment is substantial, you need to find the courage to take that first step into the void. Yes, it’s hard to know what consumers think and what their day-to-day needs are, but a business void of a long-term and consistent marketing effort is doomed. Especially in a global economy that is becoming flatter and more competitive by the day, skimping on marketing is not the way to save money, because you’ll quickly find yourself out-publicized and out-advertised by the competition. “At RME, we actually used marketing risk as a competitive edge,” Panaggio shares. “Anyone wanting to become a potential competitor had to be willing to match our marketing investment and commitment—just doing the bare minimum wouldn’t have been enough. As a result, competitors were forced to divert resources from other areas of their business to keep up with RME’s aggressive marketing strategy. And since most of our competitors weren’t willing to embrace the risk of marketing at our level, they were never able to seize our market share. Many protective business owners live by the mantra “It’s not personal; it’s business” because they assume that customers have unreasonable expectations, or that their demands will increase once you open the door of a relationship. After all, what if you start talking to them and they start wanting better pricing, extended credit, or other special considerations? That might happen with a few individuals, Panaggio acknowledges, but for the most part “getting personal” is actually one of the most effective ways to earn your customers’ long-term loyalty. Of course I shouldn’t hire people who are smarter than me, you might think. That would undermine my authority and make me seem redundant in my own organization, where I’m supposed to be the boss! Not so, says Panaggio. Yes, an employee might know more than you about a particular aspect of your business, but that doesn’t mean she and the rest of the team won’t respect you as a leader (as long as you earn their respect, that is). As a small business owner, of course you’re going to try to cut costs and stretch the budget wherever possible. And for each dollar you save, you (justifiably!) pat yourself on the back. But according to Panaggio, if you get too carried away with saving money, you might end up losing opportunities and customers. To put it another way: You can’t save your way to greatness. “I’m not saying you should waste money or go into more debt than necessary; I’m just warning you not to be cheap about the wrong things,” he clarifies. “When you’re mulling over how much money to spend, think about how your decision might affect the customer. For instance, it’s fine to fly economy and stay in a budget hotel on a business trip, but don’t take the client you’re meeting out to a cheap chain restaurant. Likewise, you can furnish your back office with the bare minimum, but make sure your retail space is attractive and comfortable. In so many ways, technology has made it easier to connect with customers. Used wisely, it can draw in potential buyers, cement the loyalty of existing customers, facilitate referrals, answer questions, and solve problems. So it’s understandable that many business owners automatically assume that more technology is always better. But if you’re not careful, technology can also be used as a barrier that keeps customers at arm’s length. Or, on the opposite end of the spectrum, it can allow you to get too cozy with customers: an inbox or newsfeed dominated by unwanted promotions, anyone? When you’re facing a crisis that could damage or even sink your business, it’s (fairly) easy to take risks. After all, if you don’t act, you’re doomed—and in that situation, there’s probably not much to gain by holding back. But what about the times when things are going smoothly, when you may have more to lose by going out on a limb? Well, then it’s much easier to convince yourself that there’s no need to tamper with the status quo. “When nothing is actively going down the toilet, it’s easy to tell yourself that things are fine, that the future is rosy, and that you don’t need to put yourself out there to improve,” observes Panaggio. “However, that kind of thinking is a good way to be left behind or to become irrelevant. Customers don’t always leave because they had a bad experience with your company…the reason is often that they simply had a better one with someone else. Remember, risks need to be taken when business is good and bad if you want to stay cutting-edge and competitive. All over the country, there are entrepreneurs—or wannabe entrepreneurs—who are waiting for “the right time” to make their big move. They’re waiting for funding, free time, better economic conditions, etc. No doubt these business owners believe they’re being smart by waiting for the stars to perfectly align—but all too often, they’re only stagnating. It’s a fair bet that at some point in time, you’ve employed a business tactic that just didn’t work. Maybe you allocated a large part of your budget to producing a television commercial, for instance, but barely noticed any increase in your business. Or maybe you offered an online deal to new customers, only to realize that the discount you advertised was a little too generous and wouldn’t allow you to make any profits. So now, if you’re like many business owners, you’ve vowed never to try again. Let’s say that you want to move to the next level, whatever that happens to be for your business. So you begin planning, preparing for every possible scenario. You define contingencies with backup plans full of redundancies. You sometimes wonder how anyone could fail with a plan that covers all possibilities and that offers each a solution. But here’s what you’re not taking into account: While your perfect plan might prevent you from failing, it will also hold you back from succeeding if it’s never executed. Many business owners lie awake at night worrying that their businesses will become obsolete if they don’t innovate. And so they bang their heads against their desks each day, driving themselves crazy trying to build a new mousetrap. What they don’t realize is that all they need to do is take the existing mousetrap and make it better. Sometimes, identifying the right decision is clear as day: All of your mentors and team members are in agreement. The numbers indisputably point in a single direction. You receive an opportunity you know the competition would kill for. But other times, the right decision is murkier than the liquid in a Magic 8 Ball. How do you proceed? Tom has enjoyed a 30-year entrepreneurial career as cofounder of two successful direct marketing companies. As a result, he can give a true perspective on starting and running a small business. His practical approach to business concepts and leadership is grounded in the belief that success is the result of a commitment to embracing risk as a way to ensure opportunity. In 1983 he cofounded Direct Mail Express (DME) in Daytona Beach, Florida, with his siblings Mike and Kathy. DME has always been on the leading edge of marketing technology and is still recognized as an industry leader in personalized digital marketing. As CEO of spin-off RME in Tampa, Florida, Tom headed a company that created the most effective lead-generation program in the financial services industry. RME revolutionized financial services marketing with its Seminar Success program, a marketing system that has created billions in sales for their clients. The Risk Advantage: Embracing the Entrepreneur’s Unexpected Edge (River Grove Books, 2013, ISBN: 978-1-938-41644-6, $14.95, www.TheRiskAdvantage.com) is available at bookstores nationwide, from major online booksellers, and at www.TheRiskAdvantage.com.